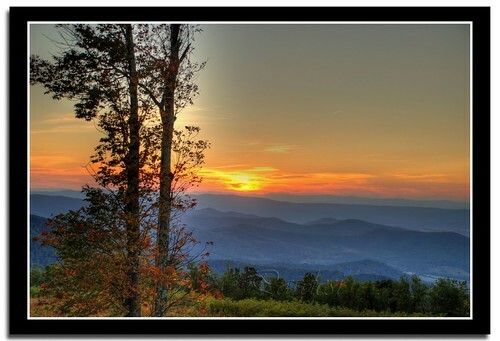 [caption id="" align="alignright" width="400" caption="Sunset on the Appalachian Trail"] [/caption] The great Wagon Road was once a principal travel route for early American settlers heading south from Philadelphia. A portion of it traverses the length of the Shenandoah Valley, where Virginia bed and breakfasts have been welcoming travelers for centuries. Today, the Shenandoah Valley welcomes visitors from around the world, many of whom travel here to visit the nearby Shenandoah National Park. Less than two hours from the nation's capital, the Shenandoah National Park offers scenic drives and a plethora of outdoor activities. It's impossible to experience all the park has to offer in just one day. They best way to experience it is to take up residence at a Virginia bed and breakfast near the Shenandoah National Park for a while, and take your time exploring it. Over 100 miles of the Appalachian Trail runs through the Shenandoah National Park, along with hundreds of miles of other trails. It's possible to enjoy a short, easy hike to a pretty waterfall or scenic overlook, or a long, strenuous hike deep into the back woods; know your capability, and bring lots of water and snacks with you. In addition to hiking, it's possible to explore the park on horseback or bicycle. Innkeepers at bed and breakfasts Virginia near the park are a wonderful resource - ask them how they most enjoy the Shenandoah National Park.